NEW YORK — Shaking off a laugh, FRED PRO got serious for a moment. “How much can we trust these guys,” he asked, referring to JIM WEDICK and JACK BRENNAN? He was talking to PHIL KITZER. They were having drinks in the Sheraton Essex lounge located on Central Park South in New York City. KITZER and PRO were “international” swindlers whose scams netted millions. Not common thieves, but top-notch con men, whose exploits were known to authorities in Europe and the United States. Scheming, you might see them sipping wine in a French restaurant overlooking the Blue Danube or having lunch on the Spanish Riviera in Malaga. Yet despite their reputations, only KITZER had a criminal record. Charged in Minneapolis, with looting $4 million from policyholders in AMERICAN ALLIED INSURANCE, prosecutors said KITZER was the “mastermind,” in a criminal conspiracy that included Minnesota Insurance Commissioner CYRUS MAGNUSSON, senior bank officials and insurance company executives in two states. The Indictment charged KITZER and 16-associates with insurance fraud citing 13-offices in Minnesota and Illinois. Newspaper headlines in Minneapolis and Chicago said testimony in the 14-week trial talked about “bribery, backroom deals, and political treachery.” But KITZER claimed differently, 8-days on the witness stand, he said the case had little to do with “fraud,” but was instead a “vicious” attack by party apparatchiks, angry because he opposed the DEMOCRATIC – FARM LABOR PARTY’s political platform, circa 1965-66. KITZER said former Governor KARL ROVAAG, Attorney General ROBERT MATTESON and U.S. Attorney MILES LORD, later appointed a U.S. District Court Judge, were out to get him. He called it a “conspiracy,” among government officials without precedence. But contrary to allegations, deliberating only 2-days, in a stinging rebuke to the Justice Department, on June 23, 1967, a jury “acquitted” KITZER and three close associates on all charges. Besides KITZER, also “acquitted” was MAGNUSSON, the Minnesota Insurance Commissioner. Jurors said the Government failed to make its case. Associates said the prosecution only fueled KITZER’s animus for the Justice Department. Disturbed about the loss, but not deterred. Prosecutors continued to look at KITZER and his financial empire. In some jurisdictions, the U.S. Attorney convened Grand Jury [GJ] proceedings which also included federal agents conducting interviews and collecting evidence. But despite the investigations prosecutors were unable to make a case against KITZER. Adept at dodging subpoenas and fighting prosecutors, in one instance, learning a judge in Chicago made disparaging remarks about one of his companies, KITZER defiantly opened a new company. He called the new company, “The 219 Dearborn Corporation,” the street address for the federal court house in Chicago. He said the next time a judge wanted to call his company a “crummy” little corporation, he/she would be talking about the court house in Chicago. His defiance emblematic. Operating overseas, taking advantage of the many jurisdictions, law enforcement experts said KITZER circled the globe with impunity orchestrating fraud schemes. Not withstanding critics, in the 10-years following the AMERICAN ALLIED prosecution, no charges were filed against KITZER and he never spent a day in jail. Departing Miami enroute to New York, KITZER told his companions PRO was a “bust” out expert, whose specialties included “preying” on companies being reorganized under bankruptcy protection. Skilled at manufacturing “bogus” invoices and liquidating assets, he said PRO would divert cash until a company went belly-up. Where PRO went financial ruin followed KITZER said. Yet despite reports suggesting mismanagement PRO lived well. His lifestyle included cruising the Caribbean, making frequent trips overseas and living on beach front property in Palm Beach. Asked about “failed” businesses left in his wake, KITZER said PRO liked to tell attorneys he wasn’t good at managing cash flow. Like PRO, KITZER also traveled extensively. Operating a network of offshore banks, KITZER sold “bogus” securities and “laundered” transactions for crime figures in United States and Europe. But unlike PRO, he kept a low profile. He didn’t put money into assets or trappings agents could seize. KITZER used banks … but “not” to deposit money. And selling “bogus” securities, he demanded “cash,” which he kept. Setting up an office on Central Park South, KITZER told PRO the operation made him an attractive target for the Justice Department. PRO disagreed. He said living on Central Park South was like visiting Paris in the Spring. It was something he had to do. Swirling his drink, PRO again inquired about WEDICK and BRENNAN. “Are you sure we can trust these two guys, he asked?” Without assurances he was reluctant to speak in front of the two men. Not put off by his remarks, KITZER shot PRO a grin and ordered another drink. He liked toying with PRO … especially when he held the cards. It was KITZER’s network of “offshore” banks that enabled PRO to buy companies being reorganized under bankruptcy protection. Once taking control, he liquidated assets diverting “cash” to finalize sale, with bogus securities being replaced or destroyed. Conmen call it, “Bootstrapping,” purchasing a company with its own assets. Each offshore bank was established overseas in the Caribbean or Europe, outside the jurisdiction of the United States and housed in an attorney’s office, staffed with a lawyer and secretary to answer the telephones and operate a telex machine. Talking about his network, the WALL STREET JOURNAL once estimated KITZER flooded the United States with more than $100 million in “bogus” securities. Twenty-four hours earlier, KITZER, WEDICK and BRENNAN were at the SHERATON FOUR AMBASSADORS, in Miami, sharing a suite overlooking Biscayne Bay. Worried British regulators were getting ready to seize SEVEN OAK FINANCE LTD in the United Kingdom, KITZER announced he needed a new bank. He recalled in Haiti he purchased a charter for a new bank calling it, “FIRST NATIONAL CITY BANK OF HAITI.” He said it was time to resurrect the charter and open the bank. Making some telephone calls, KITZER located the charter with GABE CICALE in New York. He also telephoned FRED PRO and said he was setting up a new bank. PRO was jubilant. He said he had an immediate need for securities. KITZER said he could get PRO the securities, but needed “seed” money to make the bank operational. PRO agreed to fund the bank. Flight schedules permitting, the two men agreed to meet later that afternoon at the Sheraton Essex Hotel. Picking up his drink, hearing PRO’s concern, KITZER laughed. He didn’t mince words. Over the years, he and PRO made a lot of money. In Cleveland, talking about a new scam, KITZER stopped in mid-sentence, asking who was going to initiate the “conspiracy,” he asked. “Take the first ‘overt’ act?” His comments drew “pained” expressions. But it was trademark KITZER. “Yeah, they can be trusted,” KITZER told PRO, glancing at WEDICK and BRENNAN. “They’re going to facilitate your next scam.” He said the two men were going to be bank officers in the new FIRST NATIONAL CITY BANK OF HAITI. PRO’s demeanor “immediately” changed. “Always pleased to meet new people,” he said. Hoisting his drink in a salute. His enthusiasm ecstatic. Grinning WEDICK and BRENNAN nodded … also hoisting their drinks. They were partners! Relaxed. No longer worried about KITZER’s companions. KITZER and PRO traded barbs. Each teasing the other about past schemes and who was best. Each story topped the last. But PRO changed his deportment when the topic of “offshore” banks came up. He credited KITZER with teaching him everything he knew about “bank” paper, stating KITZER was the “best,” the “master” when it came to “bogus” securities and closing deals. And at KITZER’s insistence, agreed, when it came to money, PRO “paid” KITZER, and “not” the other way around. But KITZER also had to acknowledge/concede PRO pulled off some spectacular frauds citing PARKER WEST and the GLASSIC MOTOR CAR COMPANY in Palm Beach, and the REL-REEVES CORPORATION in Boynton Beach, an $18 million telecommunications giant formerly owned by DYNAMICS CORPORATION of AMERICA. And working with mobsters in the GAMBINO crime family, famously “defrauded” the IVERSON BYCYCLE COMPANY causing stockholders to lose $44 million. PRO said included in his list of 10 best scams was ripping off ELVIS PRESLEY, the King of Rock. KITZER agreed, adding PRO had a panache for dramatics. Both men laughed uncontrollably talking about the PRESLEY scam. Spilling a drink. KITZER said, “Wheels up,” an excited PRO telephoned him from PRESLEY’s Lockheed JetStar. “We got it,” he shouted. “We got it.” Departing Memphis International Airport, KITZER said PRO called him at home using the plane’s sky phone. He said PRO kept screaming, “We got it, we got it.” Traveling to New York, PRO used the jet to secure a $1 million loan. KITZER said PRO had “cojones” taking the jet. But he wasn’t the only person who deserved credit. He reminded PRO, he needed KITZER’s bank to close the deal. Both men continued to reel about the scam. PRO said he used the jet for about six-months. Flying everywhere. Doing deals. Taking money. He said the jet was a great conversation piece adding it “opened” a lot of doors. Made it easy to get introductions and take money. Always living in the moment. KITZER and PRO didn’t worry about scams blowing up. Nor were they concerned about law enforcement. PRO called federal agents “lettermen,” while KITZER dismissed the FBI as an occupational hazard. In three short months, tragically, newspaper headlines read the KING OF ROCK was dead. The victim of an apparent heart attack. Hearing PRESLEY’s name in newscasts, the two men howled about taking the jet. Neither was concerned about the possibility they might be prosecuted for defrauding the singer. Both men thought authorities would chalk up the scam as a bad business deal. 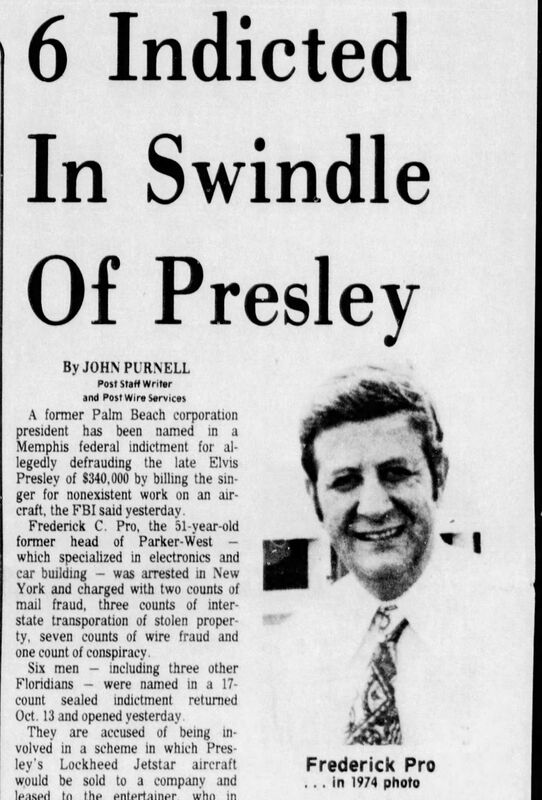 Maybe place the blame on PRESLEY’s father, VERNON, since his business acumen was known to be suspect. But unbeknownst to the two men, PRO’s suspicions were dead on. KITZER and PRO were in serious trouble. The Justice Department had launched an “unprecedent” undercover operation and both men were targets. BRENNAN and WEDICK were FBI undercover agents. A true crime drama, “CHASING PHIL: The Adventures of Two Undercover Agents with the World’s Most Charming Con Man,” authored by DAVID HOWARD [CROWN (OCT 2017)] is the story of FBI undercover agents, JIM WEDICK and JACK BRENNAN, infiltrating the world of PHIL KITZER, a globetrotting swindler, who authorities said fleeced millions setting up “offshore” banks, selling “bogus” securities and laundering money for Organized Crime [OC] figures in New York, including the LUCCHESE, GENOVESE and GAMBINO crime families. Framed in exotic locales, CHASING PHIL details the FBI’s initial efforts to use sophisticated long-term undercover operations and White-Collar-Crime [WCC] violations to investigate/prosecute OC figures, circa 1976-78. Under the FBI’s new case management system, code named, “OPFOPEN [an acronym for Operation Fountain Pen], MAJOR CASE #1, Office of Origin [OO]: Indianapolis [IP],” the investigation targeted OC figures in the US and Europe, and members of Geneva, Switzerland’s famed financial underworld using FBI undercover agents. Included in the list of scams were efforts by members of the GAMBINO crime family to infiltrate/take control of the BROOKHAVEN MORTGAGE SERVICE COMPANY, in [Melville] Long Island, New York wanting to use the company’s $150 million loan portfolio to make street loans and fund drug operations. Writing for the PHILADELPHIA INQUIRER in article captioned, “The STING: From New York to Florida to New Jersey to Washington to Philadelphia,” dated February 10, 1980, ROBERT HODIERNE told readers it was agents WEDICK and BRENNAN working with MYRON FULLER in New York that caused the FBI to initiate its famed ABSCAM case and use MEL WEINBERG, the confidential source whose information caused six members of Congress and one US Senator to be prosecuted for soliciting “bribes.” Initially proposed to investigate/prosecute mobsters infiltrating legitimate businesses, as a result of electronic intercepts secured in the Title-III coverage of PRO’s office on Central Park South, e.g. BROOKHAVEN MORTGAGE COMPANY, the investigation’s focus changed to Public Corruption when WEINBERG reported former Camden, NJ Mayor ANGELO J. ENRICHETTI, then a State Senator, wanted $25,000 in exchange for his assistance, helping UC agents secure a gaming permit in Atlantic City. Learning about the OPFOPEN investigation, WARNER BROS PICS secured rights to produce feature film with ROBERT DOWNEY JR. producing/possibly staring as PHIL KITZER, with DAVID BAR KATZ asked to write the screenplay. In December 2017, the MOB MUSEUM invited author DAVID HOWARD and JIM WEDICK to give presentation concerning KITZER’s association with the mob inside the museum’s KEFAUVER court room exhibit hall. The exhibit replicates the room where the KEFAUVER COMMITTEE HEARINGS were held chaired by Senator Estes KEFAUVER, circa 1950-51. Renovated at a cost totaling almost $45 million, the MOB MUSEUM is housed in the old courthouse where SEN KEFAUVER and his committee took testimony in Las Vegas. In the FBI for almost 35-years, Mr. WEDICK’s career includes being an FBI undercover agent, case agent, and later frontline supervisor responsible for the FBI’s corruption squad in Sacramento, California. Besides initiating the FBI’s “OPFOPEN” investigation that targeted globe-trotting conmen and Organized Crime [OC] figures using “offshore” banks to launder money, sell “bogus” securities and conduct fraudulent transactions; Mr. WEDICK’s background includes 1.] brief undercover roles in the FBI’s ABSCAM case where members of Congress were prosecuted for soliciting bribes; and 2.] code named, “SKINBURN,” prosecuting the sons of New York mobster JOE BONANNO responsible for defrauding hundreds of thousand dollars from businesses and individuals in California and Utah. Dubbed “SHRIMPSCAM” by members of the news media talking about the FBI’s 3-year undercover probe of the California State Legislature, circa 1985-88, in 1994, Mr. WEDICK received the FBI Director’s Award for prosecuting 5-veteran California lawmakers on RICO and corruption charges with his performance cited in the U.S. Congressional record. Because the investigation involved a complicated “undercover” scenario using “bogus” legislation introduced/passed in both houses of state government, Assembly Bill [AB] 3773 in 1986 and AB 4203 in 1988, that required the specific approval of the FBI Director, Mr. WEDICK was also nominated for the Attorney General’s Award and he was featured in a LOS ANGELES TIMES SUNDAY MAGAZINE article captioned, “The G-Man, the Shrimp Scam and Sacramento’s Big Sting: FBI Agent JAMES WEDICK’s Undercover Operation Netted 14 Public Officials. But Has It Changed the Way the State Legislature Works?” by MARK GLADSTONE and PAUL JACOBS, dated December 11, 1994. Likewise, amid allegations suggesting Fresno area officials were seeking “bribes” in exchange for favorable zoning changes, in 1996-97, Mr. WEDICK conducted investigation code named, “REZONE,” prosecuting 17-defendants, including county officials, lobbyists and businessmen … all charged with violations of RICO and corruption statutes … again securing convictions. And because auditors suggested Medicaid Fraud had become the crime du jour amongst White Collar Crime [WCC] thieves, during period 1998 thru 2001, Mr. WEDICK launched 3-Health Care Fraud Initiatives prosecuting 324-medical providers charged with defrauding funds totaling in excess of $228-million. The successful FBI Initiatives attracted the attention of both broadcast and print journalists alike, with 60 MINUTES and MIKE WALLACE doing a segment detailing the investigations, as did the LA TIMES who did a nine-part series detailing the fraudulent abuse of California’s Medicaid Program. You can also follow JAMES J WEDICK on Twitter and LinkedIn.